Bharti Airtel says the new offer is similar to Jio's previous offer stalled by TRAI. 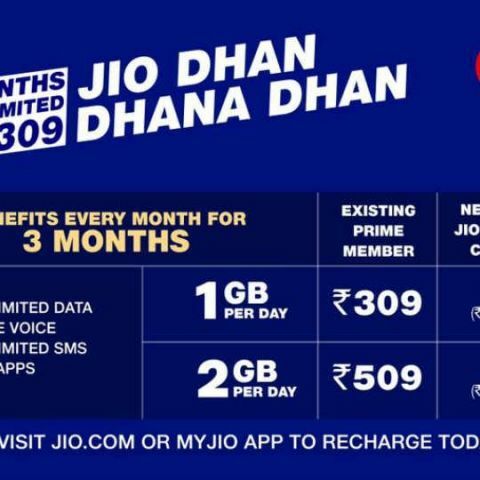 Under Jio Dhan Dhana Dhan offer, Prime members can get existing benefits for 84 days with recharge of Rs 309. or above. Reliance Jio's 'Dhan Dhana Dhan' offer is being criticised by top telecom operator Bharti Airtel. After TRAI forced Jio to withdraw its Summer Surprise Offer, the company has announced a new plan that offers unlimited voice calling and 1GB 4G data per day with a one-time recharge of Rs 309 and above. Bharti Airtel, however, says the new offer is similar to Jio's previous offer stalled by TRAI. Reliance Jio's Dhan Dhana Dhan offer announced yesterday comes with a validity of 84 days and includes freebies such as free voice calls, SMS and access to Jio apps. Under Jio Dhan Dhana Dhan plan, a one-time recharge of Rs. 309 or Rs. 509 gives 1GB data per day to its Prime customers who have already recharged with one-time fee of Rs 99. Non-Prime users can enroll by paying one-time fee and then recharging with new plan. "Jio is currently implementing the world's largest migration from free to paid services in such a short period of time. In order to smoothen the migration from free to paid services, Jio has implemented simple, affordable and regulatory-compliant plans in customer interest," the company said in a statement on Tuesday. Jio claims to have over 100 million subscribers with 72 million of them said to have subscribed to Prime membership. Reliance Jio's Dhan Dhana Dhan offer comes after TRAI asked the telecom service provider to withdraw its Jio Summer Surprise Offer. Under that offer, Prime members doing first recharge of Rs. 303 or above were given complimentary access to existing benefits for three months. "We are surprised to see what Jio is doing. It violates the spirit of the TRAI directive and essentially continues with a similar plan now masquerading under a different name," an Airtel spokesperson told ET. Since its public availability in September, Reliance Jio has been offering services to subscribers for free. The company's offers have been widely criticised by telcos and most of them even moved against its free data benefits. While Jio claims its new offer to be compliant with rules, it will now again be referred to TRAI to decide whether it is actually similar to Summer Surprise offer, or not.